The Trustees of the Friends of Basrah Museum (FOBM) were deeply saddened to hear of the sudden death of their fellow Trustee Dr Lamia Al Gailani Werr. Lamia died last Friday 18 January 2019 in Amman, Jordan and has been buried in Baghdad on 21 January. 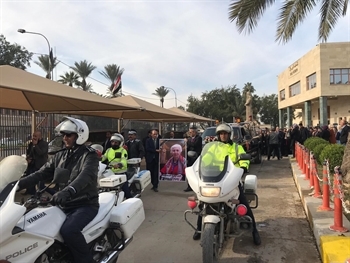 There was a special procession from the Iraq Museum to the Gailani shrine, where she has been laid to rest. 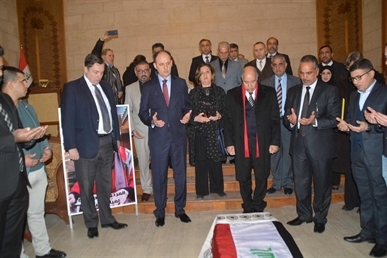 Many dignataries were there for the funeral ceremony, including HE Dr Abdulamir Al Hamdani, Minister of Culture, HE Qais Al Rasheed, Chairman of the State Board of Antiquites and Heritage, Maysoon Damluji MP, Mr Qahtan Al Abeed and HMA Jon Wilks CMG, UK Ambassador to Iraq. We also wish we could have been there with them all. Our deepest condolences to her daughters, family, friends and colleagues. The FOBM and the British Institute for the Study of Iraq (BISI) and many colleagues world-wide and in Iraq relied upon her fountain of wisdom and profound knowledge of Iraq and Mesopotamian archaeology and in particular of cylinder seals. She shared her knowledge unstintingly with kindness and good humour. In 2010 she became a Trustee of the Friends of Basrah Museum with Sir Terence Clark and Dr John Curtis and other founding Trustees and had been working tirelessly on that project before and since that time. 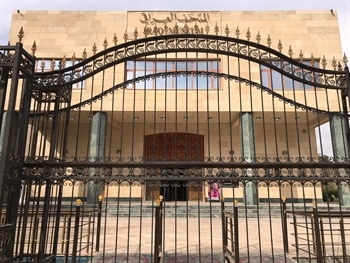 The Basrah Museum opened in September 2016 with one gallery and a two-day BISI international conference followed. She was active at the museum opening and the conference. 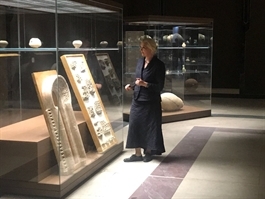 When the Trustees were subsequently awarded a large Cultural Protection Fund (CPF) grant in 2016 to further the project, she continued to work tirelessly with many visits to the Iraq Museum particularly on the selection of objects for the remaining Basrah Museum galleries. 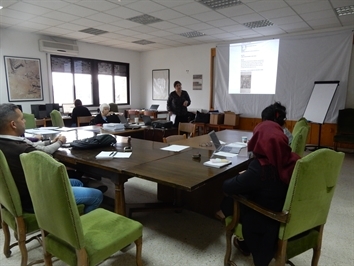 Lamia participated in two FOBM training programmes for the Basrah Museum staff and volunteers in January and December 2018 along with her daughter Dr Noorah Al Gailani. 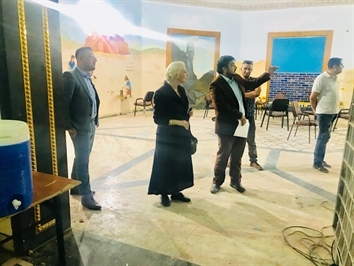 She worked closely with Qahtan Al Abeed, Director of Basrah Antiquities and Heritage, and with the Qais Al Rasheed, Chairman of the State Board of Antiquities and Heritage, and the Iraq Museum staff. She was very pleased recently to work with Mrs Lumah Al Douri, the new Iraq Museum Director. The following photos show her at the opening of the Basrah Museum with some of the participants in the conference; presenting her talk on the History of the Iraq Museum in January 2018 at the Basrah Museum Training Programme; presenting an award in the first training programme to Siham Giwad Dadhun, Director of the Maisan Museum, with Mahdi Al Musawi, Qahtan Alabeed, Dr Paul Collins (BISI Chair and lead trainer) and Joan Porter MacIver looking on. Dr Lamia al-Gailani-Werr grew up in Baghdad and studied at the University of Baghdad before coming to Cambridge on a Scholarship. She returned to Baghdad and work at the Museum in 1961 as one of the small number of women archaeologists. She later completed a second MA degree at the University of Edinburgh and her PhD at the University of London. In 2003 she returned to Baghdad after the looting of the Museum to assist Iraqi colleagues. She was an Honorary Research Associate of the Institute of Archaeology UCL. She has been working on a book on the History of the Iraq Museum and had been a research fellow at the Metropolitan Museum. Amongst her very many research topics, she had been working on Gertrude Bell archives in the museum and was a special advisor to the Co-directors of the film Letters from Baghdad which screened in Baghdad last year. She was the British Institute for the Study of Iraq’s only Honorary Life-time member and recipient of its Gertrude Bell Memorial Gold Medal "for outstanding services to Mesopotamian archaeology" in 2009. 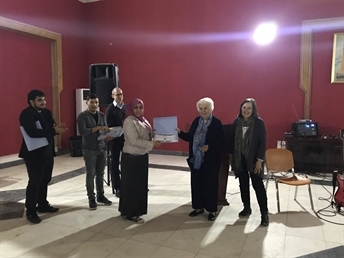 She provided unceasing efforts and invaluable advice and energies in sustaining academic and personal links between scholars in the UK and Iraq. Her continuing input into the BSAI/BISI's highly active Visiting Scholars programme, currently linked to the Nahrein Network, has been fundamental to its great success, providing training and experience to a broad range of Iraqi colleagues who have taken their enhanced skills back to Iraq. She cared deeply for her Iraqi colleagues and Iraq and its heritage. She will be greatly missed. 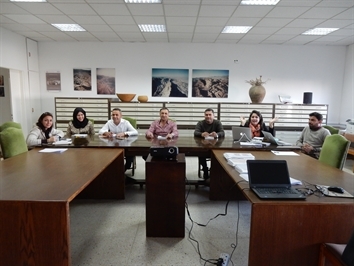 The Friends of Basrah Museum (FOBM) held its second training workshop from 8 to 13 December 2018 for seven Basrah Museum staff members and volunteers at ACOR in Amman, Jordan. Four of the seven trainees had attended the first FOBM programme in January 2018 in Basrah. 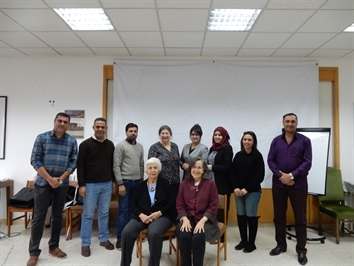 Dr Noorah Al Gailani and Dr Lamia Al Gailani-Werr were involved in the training aspects for both programmes, which provided continuity and Dr John Curtis took part in the December 2018 training on labelling. FOBM Workshop Trainers and Organiser were Dr Noorah Al Gailani (Glasgow Museums/Glasgowlife), FOBM Trustees - Dr Lamia Al Gailani Werr and Dr John Curtis OBE, FBA and Joan Porter MacIver, FOBM Training Workshop coordinator. The Training Programme was supported by Dr Barbara A. Porter, ACOR Director, and ACOR's wonderful staff and the USAID SCHEP team members. The training programme was funded through the Cultural Protection Fund grant. We are particularly grateful to the ACOR Administrative team for all the smooth arrangements and also to the ACOR Library staff for giving so generously of their time to show the trainees how to use the library. We hope to be working with them in the future on the establishment of a Basrah Museum library as part of the overall project. Michael Morris, Independent Conservator and ACOR CAORC 2018 fellow, gave a presentations on the conservation and Restoration of the Petra North Ridge Aphrodites and Dr Barbara Porter gave an overview of the Petra Papyri conservation and the publication programme on the papyri in the ACOR conservation labs. 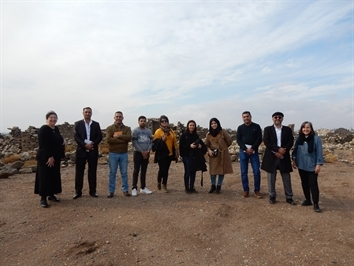 On the second day the group visited the site of Umm El Jimal as guests of USAID SCHEP Project (The Sustainable Cultural Heritage Through Engagement of Local Communities) for a special event celebrating the completion of USAID SCHEP's work with the Umm el-Jimal Archaelogical Project. 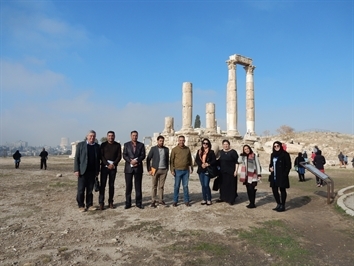 The group were taken around the site by Jehad Haron, Deputy Chief of Party. 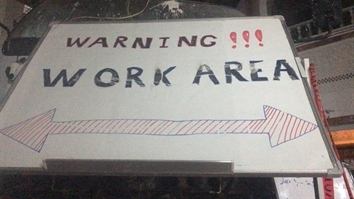 In the photo he is discussing the signage on the site. The group spent time studying labels and signage at the Jordan Archaeological Museum, the Jordan Museum, and the Al Ahli Bank Numismatic Museum - the latter through the kindness of Hasan Zyoud, Museum Manager, who arranged a kind gift of important books to the Basrah Museum. The majority of the workshop time was focused on discussions of signage and labelling and researching information on the objects in the collection. 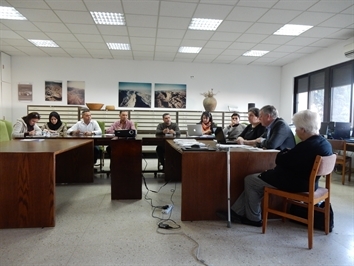 Dr Noorah Al Gailani, Dr Lamia Al Gailani-Werr and Dr John Curtis led the discussions and Jordan Museum Curator Dr Ahmed Al Momami provided an afternoon presentation on the Jordan on day one of the workshop. Dr Curtis presenting ideas to the group with Dr Noorah Al Gailani on his right and Dr Lamia Al Gailani-Werr left and Dr Noorah Al Gailani summing up the workshop conclusions. 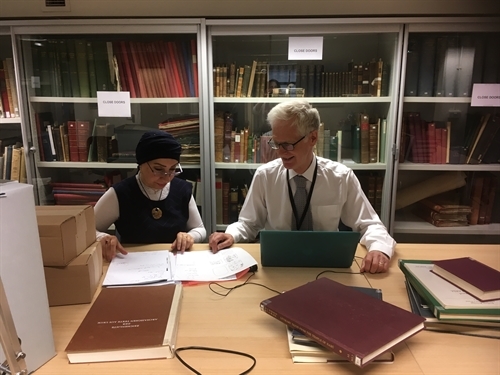 Dr Ilham Al Ameer of the Cuneiform Department of the Iraq Museum spent the month of September working with Mr Christopher Walker at the British Museum on the decipherment of 60 tablets selected for the Basrah Museum. They prepared labels in English and Dr Ilham has subsequently translated them into Arabic. This is the start of a process to ensure the objects are labelled for the Museum. 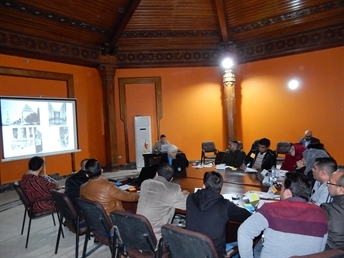 There will be a training programme for Basrah Museum staff and volunteers with on-going work identifying objects with Iraqi and international scholars. 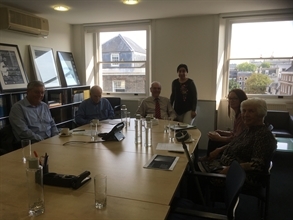 Dr Ilham met with the FOBM Trustees at the start of her stay and we were delighted later to introduce Dr Ilham to Professor Eleanor Robson of UCL and the Nahrein Network (NN). The FOBM are very grateful to Mr Walker for his kind collaboration and to Dr Jonathan Tubb, Keeper (Head) of the department for supporting this work under his department's auspices. Photos: (Left) Dr Ilham with FOBM Trustees - Dr John Curtis, Mr Peter Hunt (HWH & Associates - Project Managers Basrah), Sir Terence Clark, Dr Ilham Al Ameer, Angela Grimshaw & Dr Lamia Al Gailani-Werr. 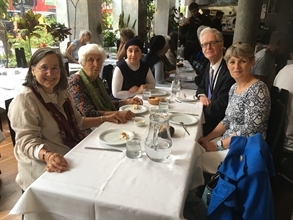 (Middle) Joan Porter MacIver (Project Coordinator), Dr Lamia Al-Gailani Werr, Dr Ilham, Mr Christopher Walker and Professor Eleanor Robson. (Right) Dr Ilham with Mr Christopher Walker looking at details of a tablet from Uruk at the British Museum. 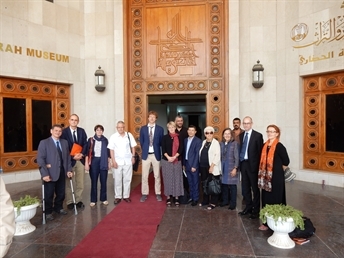 The Country Head of British Council Iraq Victoria Lindsay visited the museum on 8 August and was guided around by Mahdi Al Musawi of Bur Alaman and the Iraqi Friends of Basrah Museum. 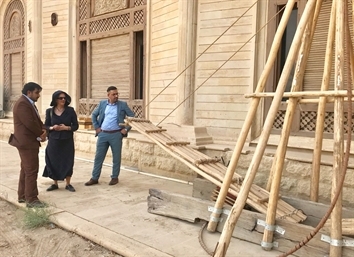 In addition to visiting the Basrah Gallery, she looked at the exterior of the building and some building work and the Education Room, which is being created and refurbished with an anonymous grant arranged through the British Institute for the Study of Iraq (BISI) in collaboration with the FOBM. The 54 Reier Museum Display cases were delivered to the Museum in the Spring and have been unpacked and placed in the three galleries. Bur Alaman worked with the Museum Director to arrange the port clearance. 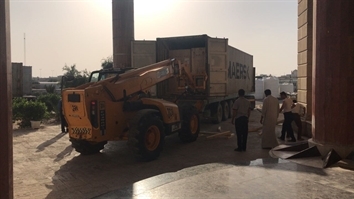 A number of containers arrived at the museum and all the cases were unloaded and kept in the Museum. 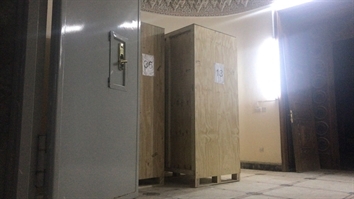 Subsequently the crates with the cases have all been unpacked and put into place into the three remaining galleries - the Sumer, Assyrian and Babylonian Galleries. 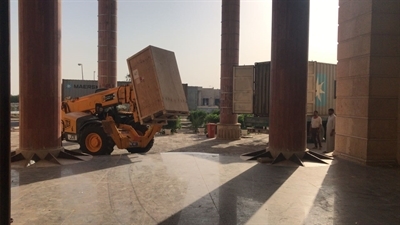 All the objects have been selected by a joint committee at the Iraq Museum and will be delivered to Basrah Museum before the end of the year.